I have been so busy visiting everyone’s blog posts about the postcarding joy that I forgot about my own! 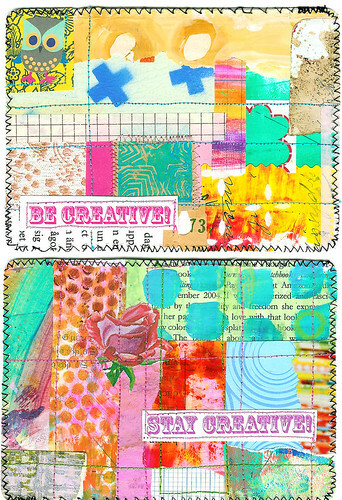 So far I’ve only shared little hints of my postcard process on the blog, but today I took the time to edit and upload all the scanned postcards I made for the DIY Postcard Swap! And of course I do remember the postcarding joy! 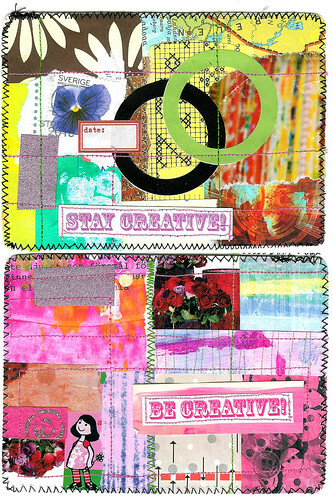 Creating, sharing and making colourful cards with positive messages – that is just happiness to me! 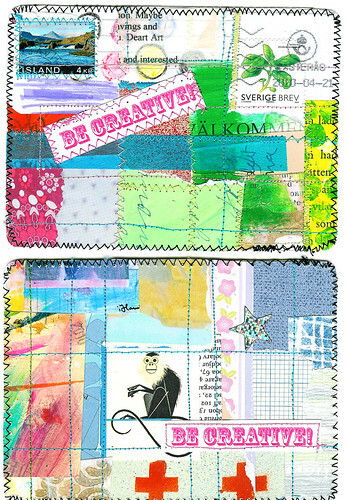 Be creative my friends, act creative and then stay creative! – that’s my message here. I have received all of my ten postcards (and a few extras, thanks to some naughty girls!) and they are all hanging on my Inspiration board right now. Love all of them so much! They are all so pretty and inspirational in different ways. 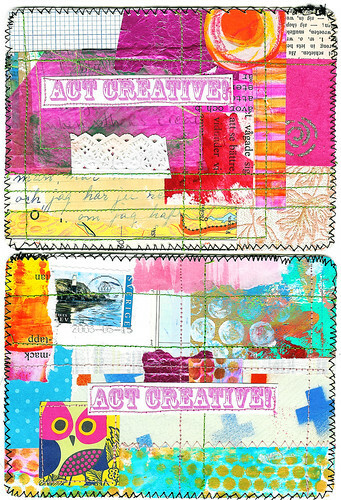 I know my own postcards have reached their destinations too, because I have seen them on various blogs lately! Later I am thinking of maybe creating some kind of album or book with the postcards I got… we’ll see. Thanks to everyone who participated, you all rock! 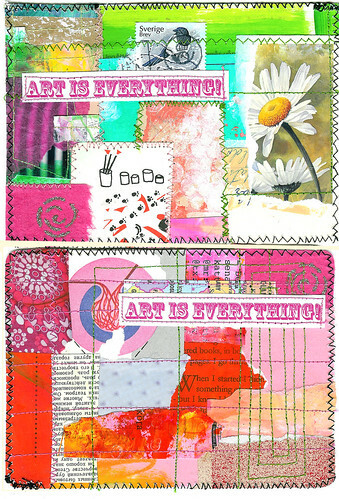 This entry was posted in A Creative Life, Paper Crafting and tagged paper sewing, postcard idea, postcard swap, swapping. Bookmark the permalink. Oh good golly… the are just beautiful. I totally have to get in on the next swap. you’re amazing! these are amazing! i love every one of them! What an awesome set of cards. Wowza those are beautiful. I can’t stop staring. Wow, they are all Hanna special. Lovely colours and really nice design. You are very talented Hanna ! De ?r s? fina allihop!! Jag v?ntar fortfarande p? tv? kort, h?ll tummarna! Det h?r har varit ett fantastiskt swap, tack f?r att du organiserat alltihop! They are so bright and cheery, Hanna ! They all make me smile. And I was lucky enough to receive one ! Yay ! Thanks again for all the hard work you did to make it such a great swap. 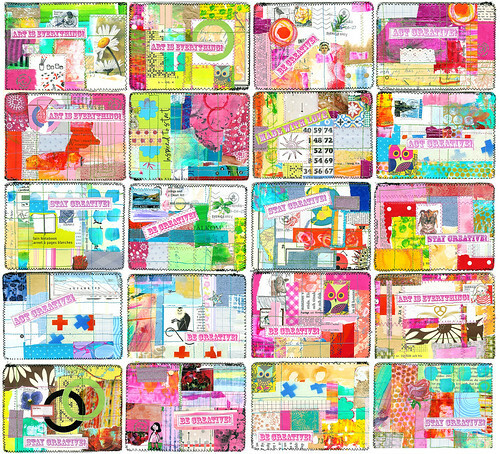 Amazing…So many good mood cards!!! They are absolutely adorable! Happy belated birthday!!! 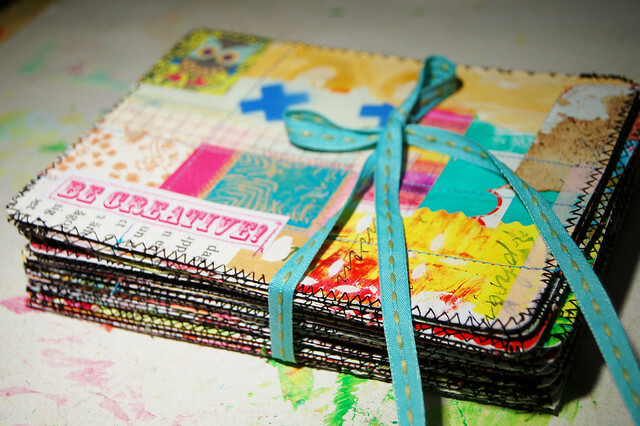 These cards are amazing….love the color, the stitching….everything! 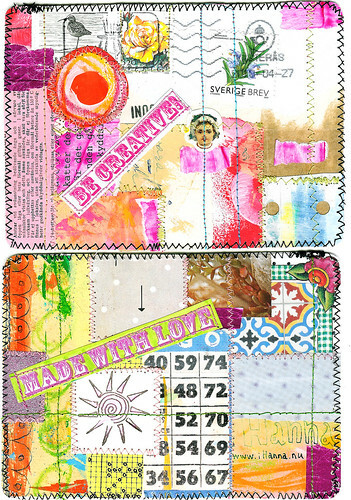 Thanks for hosting the swap…I had fun making my cards! 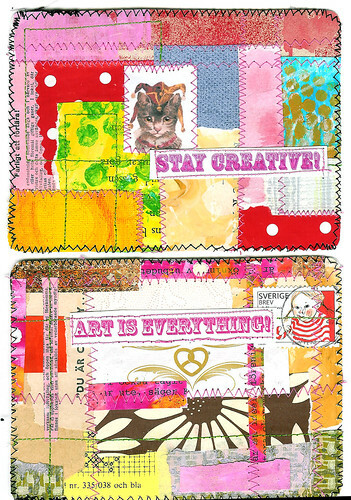 Are these just glues down collage elements with random stitching? They’re lovely, wish I would be getting one come in my mailbox. I hope your postcard swap goes smoothly and is successful. 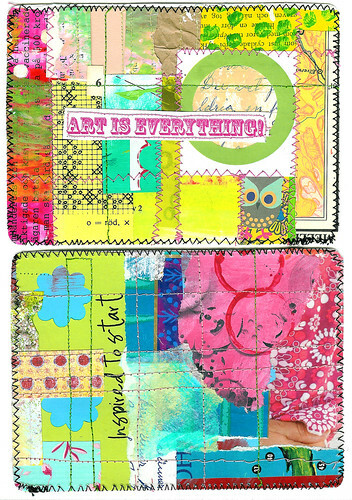 I got your card and it is the most luscious, cheery, artful, fun card, ever and I want a tattoo of it. Thanks for this swap. I’ve made some sweet bloggy friends and I have gotten my cards, too, and look forward to doing a special post about all of them. I thought I signed up for your newsletter! I’m going to go do that now, and I want to hear the MINUTE you have a swap going on! S? flotte postkort. Gleder meg til neste ?r. Ny runde med kort. Jeg venter fortsatt p? 2 kort. Ha en fortsatt fin p?ske. Beautiful postcards, Hanna! (I wish I had been on your list…) I love your style and your colors. Major “eye candy”, as they say! 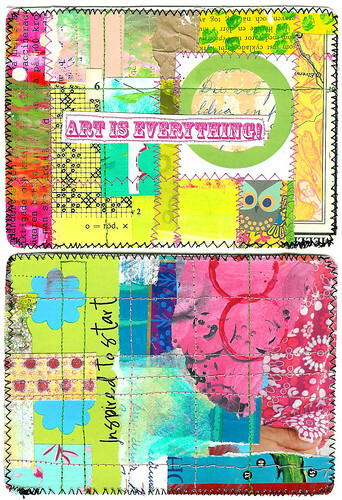 What a riot of colors, I love these cards and the messages are a nice touch! 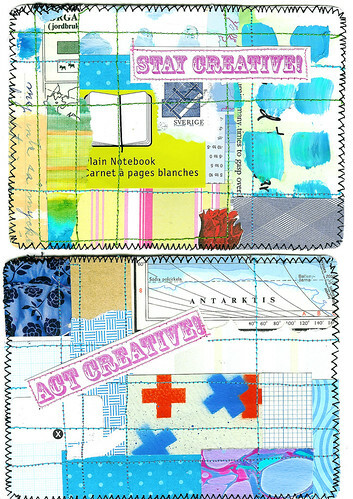 I’ve been posting my process on my blog and hope to get all my cards uploaded to the flickr group this weekend. LOVE your postcards. Beautiful collage-y goodness! I just wanted to say a BIG thank you for your postcard swap this year. Coming home from work to see what the postman has delivered has been so exciting and the artwork that everyone has produced is so inspiring! So a big BIG thank you Hanna for organising it! dang, you are a bust bee. 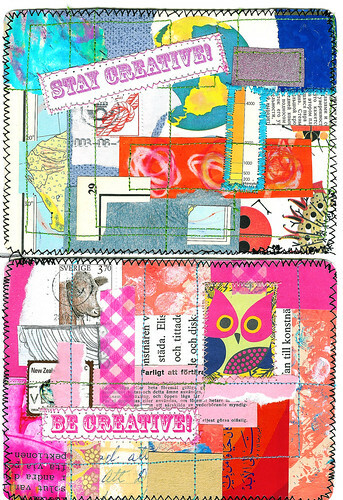 I love handmade postcards, yours are wicked! Your postcards are so bright and happy! I feel lucky to have one of them in my collection now. I’m still waiting on postcards but the ones I received so far are all gorgeous! PS I don’t if it would be possible for you but is there any way you could remind the swappers to let their swappers that the postcards arrived? My mom and I only received 4-5 notices. Wow, those postcards are gorgeous! Your postcards are so beautiful and your skills at hostessing such a huge event are amazing! I’m sad to admit that I didn’t get through all the swappers either. I do hope to try and connect with more in the next weeks, but it was a HUGE amount of blogs to visit. After many hours I let go and realized I did my best in the time I had. I’m looking forward to visiting my post office box this week though because I’m thinking the last few will be there which of course will lead to more connecting!! The scan of 22 postcards can be a very nice, sweet & brilliant wall paper. I’m so much fun to get myself in this swap.